The Ladies Firsts got back to winning ways with a 6-4 win over Lutterworth to keep the pressure on Northampton and stay second in the league. The Ladies Development lost their first league game of the season losing 6-4 to Asfordby. 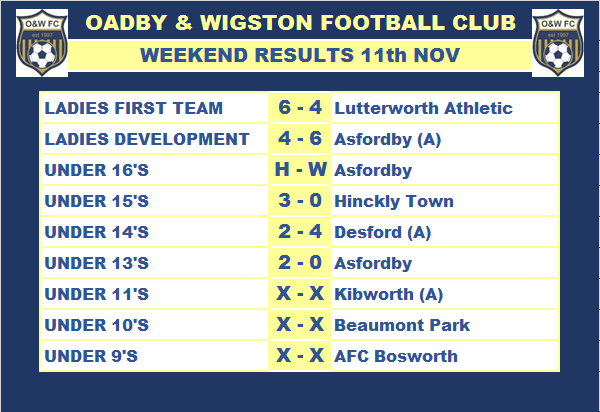 Our U16’s got a free weekend and home win as Asfordby were unable to play. The U15’s got their first win with a 3-0 score at home vs Hinckley Town, well done girls! Our U14’s are still searching for their first league win with a narrow 4-2 defeat away to Desford. Two goals from Aimee. The U13’s won 2-0 against bottom of the table Asfordby to move up to 4th place. The u11/10 and 9’s all had good games this weekend. Thanks to all the Team’s in observing the Remembrance Sunday silences with respect this weekend. Lest we forget. Oadby & Wigston Football Club prides itself on spotting talented footballers and showing them the pathway to achieve their full potential. We currently have ex-players competing at the highest level in the Womens Super League and in the Womens FA Premier League.